Every single day fires cause hundreds of thousands of dollars of property damage and result in serious injury and sometimes death. There are steps that you can take before a fire starts that will help insure your safety in case a fire starts. 1. Fire Safety - Make sure you know where the fire extinguishers are located in your area of work. I don't mean on a diagram in your company's safety plan manual. I mean physically walk around to each fire extinguisher located in your work area and look at each one. 3.Fire Safety - Know where all exits are located and make sure there is a lighted exit sign above the exit. Exit lights are almost always taken for granted. Unfortunately, most people think that the exit light is only for showing where the stairwell or exit is located. In reality this is a secondary function of the exit light. The real function of an exit light is to show you where to exit in case of an emergency or when the lights go out. If an exit light does not have a functional backup battery you may not be able to find the exit when the lights go out or in case of a fire. Exit light bulbs and batteries should be checked at least once a year by a professional fire protection company. All blown bulbs should be replaced with new ones and weak or dead batteries must also be replaced. If you do not know when the last time your exit lights were checked you should call a fire protection company and make sure the exit lights are check annually along with your fire extinguishers. If at anytime your notice that a bulb is out, the exit sign is burnt looking, discolored or otherwise not functioning properly call the fire protection company out to check all exit lights in the building. 4.Fire Safety -Know where all emergency lighting is located and make sure they function properly. An Emergency light is also a piece of equipment that is taken for granted. Take a look around your work area or building and you will see that either on the ceiling or at the top of walls there are located metal boxes with normally two large light bulbs coming out of the boxes. These look very much like security lights that you normally find outside homes. Unlike exit lights these lights will not turned on unless there is an emergency. This is because these lights are designed to be strong enough to provide adaquate light to exit the building if the power goes out. Emergency Lights have large batteries inside them which provides power for the lights in case the power goes out for any reason. Even though there is a requirement to have these checked by fire code annually, it is surprising how many businesses do not have these checked annually. Add this to your list of safety measures that must be in place. Have emergency lights checked annually at the same time fire extinguisher and exit lights are inspected. 5. Fire Safety -If working in a kitchen make sure you know how to operate the kitchen fire suppression system. Most people do not know this but, inside every commercial cooking hood there is a fire suppression system. This is an system that is designed to activate automatically when a fire reaches a certain temperature at a certain height. This temperature rating is determined by a professional fire protection company. The most important thing for those working/cooking with these areas is how to activate the fire suppression system if a fire gets out of control and the kitchen fire suppression system does not activate automatically. On the wall of every commercial cooking facility (restaurants, church kitchens, school kitchens and other kitchens) is located a manual pull station. To activate the kitchen fire suppression system, you simply pull the automatic pull station handle outward. The system should activate at that time. All personnel should then exit the building and the fire department should be notified immediately. 6.Fire Safety - Make sure your commercial kitchen (any kitchen other than a kitchen in a home) has a K-Class fire extinguisher within 30 feet of the cooking appliance. A K-Class fire extinguisher is fire extinguisher that contains a liquid specifically designed to put out grease or oil fires. Even if you do not use grease or oil to cook in a deep fryer you need a K-Class fire extinguisher because most people will use oil or grease in a pan to fry at one time or another. 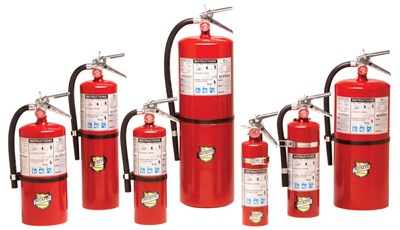 7.Fire Safety - Make sure someone from your company checks all fire extinguishers monthly. This is not the yearly inspection and maintenance that will be performed by a professional fire extinguisher company.. This is only a quick check to make sure that the fire extinguishers are fully charged and in place. Never let a fire extinguisher remain discharged for a long time. This extinguisher may have to be discarded due to damage caused by powder sitting too long. And never leave a fire extinguisher on the floor or use it as a door stopper. This will lead to fire extinguisher damage, may discharge if it falls or is knocked over, and will lead to chaos if a fire occurs. Make sure all fire extinguishers are in a the location designated by the professional fire protection company. There is a reason why each fire extinguisher is placed in a specific location per fire code. 8.Fire Safety - Have a emergency/fire plan in place and have each person know what their role is in case a fire occurs. At least annually have a fire drill. This means have everybody go outside just like you did in high school during a fire drill. There are many resources for this. But, if you need help with this contact me. 9.Fire Safety - Make sure you have a yearly survey and training by a reputable fire protection company. The fire protection company will be able to tell you if you have an adequate amount of fire extinguishers and other fire protection equipment to put out the type of fire that is likely to occur at you location. The reputable fire protection company will also be able to train your staff on how to properly use fire extinguishers and kitchen fire suppression systems. This can be done onsite at your work location. It is recommended that you have your staff trained on the use fo fire protection equipment at least once a year. This can be done on the same day as your company fire drill. 10.Fire Safety - Make sure that all fire extinguishers, exit lights and emergency lights are checked by an reputable company yearly. All kitchen fire suppression systems must be inspected and maintained every 6 months by fire code. This is very important and often overlooked. When you look up at an exit light you may see that it is lighted. This is because the power is not out. You need a fire protection company to make sure that the exit lights and emergency lights will function even when the power is off. That is when you need them most. 11. Fire Safety -Make sure commercial kitchen hoods are cleaned free of all grease every 1 to 6 months. Most people do not know that kitchen hoods located in restaurants, schools, churches, etc. should be cleaned every 1-6 months. Many kitchen hoods are full of grease and oil from cooking. Besides being potentially unhealthy this grease and oil is a serious fire hazard. Obviously locations such as Chinese restaurants, Mexican restaurants and locations that fry a lot of food need to be cleaned more often than a church that just cooks once a week. But do not take it for granted that because a kitchen hood looks clean on the outside that it is not a fire hazard. Many times the interior of the hood and the hood ducts may be covered or even dripping with grease and oil even though the outside of the hood has been cleaned by the restaurant staff. Per fire code these hoods should be cleaned by a professional fire protection or hood cleaning company. I personally recommend persons in charge of commercial kitchen hoods to use a hood cleaning company that is also a fire protection company. After all the reason for the cleaning is for fire protection more than anything else. Michael Irvin is the General Manager and VP of Marketing and Sales. He has over 20 years experience in Fire Protection, Marketing, Sales, and Management. Mr. Irvin studied Mechanical and Materials Engineering at the University of New Yorkin New York, NY, Newark, NJ, Los Angeles, CA. He holds a Bachelors of Marketing and Management and studied law at Mid-Island, NY 10314School of Law. Mr. Irvin is fluent in both English and Spanish. Be safe. Michael IrvinGeneral Manager FESCO Fire Extinguisher & Safety Service Company, LLC always remember that Fire Safety is of utmost importance to FESCO. Liked this article? Click here to publish it on your website or blog, it's free and easy!